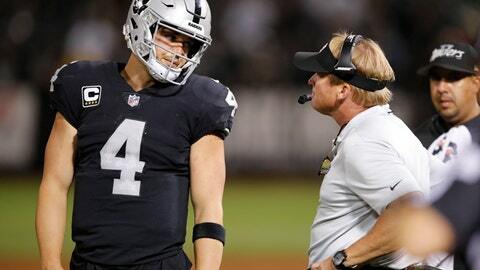 ALAMEDA, Calif. (AP) — Derek Carr knew there would be growing pains adjusting to a new offense for the Oakland Raiders under coach Jon Gruden. The surprising part for Carr and the Raiders is instead of showing steady progress throughout the year, the offense instead has regressed. The Raiders (1-8) head into Sunday’s game at Arizona (2-7) having gone back-to-back games without a touchdown for the first time since 2012, with the nine combined points in losses to San Francisco and the Chargers marking the lowest two-game output for Oakland since 2009. “It gets frustrating because I know how hard some of our guys work and you expect it to continue to go this way,” Carr said about the early season progress that hasn’t been maintained. “But this league, it’s tough man, and it’ll humble some guys really quick. … When you turn the film on it’s like, dang, if I just had that, or if I just would have checked to this or done this. The Raiders will try to improve the production this week despite possibly missing several key pieces on offense. Receiver Martavis Bryant is out at least a couple of weeks with a knee injury and receiver Jordy Nelson didn’t practice Wednesday with a knee injury that has put his status in doubt this week. Oakland already is without injured running back Marshawn Lynch, who is on injured reserve with a groin injury, and traded away No. 1 receiver Amari Cooper last month to Dallas. That will likely give an opportunity this week to rookie Marcell Ateman, who began the year on the practice squad and has been inactive since getting promoted to the 53-man roster last month. Undrafted rookie Saeed Blacknall was promoted from the practice squad Wednesday and also could play a role. Carr has been impressed with Ateman’s hard work at practice and attention to detail. “One thing that really stuck out is during games, he’ll come up to me and ask questions, not in a bothersome way or anything like that just, ‘Hey, what did you see here? What if they ran the route like this? '” Carr said. Ateman showed flashes in training camp, as he was able to use his size and jumping ability to make contested catches even when going up against the first team. Ateman said the past few months of practice have made him even more ready to perform on Sunday. NOTES: C Rodney Hudson (ankle), G Kelechi Osemele (knee), CB Gareon Conley (ankle), CB Daryl Worley (shoulder) and LB Kyle Wilber (knee) were all limited in practice. … The Raiders also signed WRs Rashard Davis and WR ArDarius Stewart to the practice squad.